Nvidia’sGPU Technology Conference kicks off Tuesday in California, with CEO Jensen Huang expected to take the stage at noon Eastern time. The stock was one of the best-performing of 2017, and investors will be looking for updates from the company on a range of business units including gaming chips, AI, and self-driving cars. 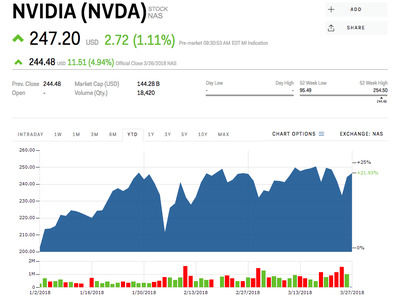 Shares of Nvidia were up just over 1% in early trading Wednesday as the company’s GPU Technology Conference – one of the most highly anticipated artificial intelligence events of the year – kicks off in San Jose, California. CEO Jensen Huang is scheduled to take the stage at 9am Pacific Time (12 pm Eastern) to deliver a keynote address to the conference’s expected 8,000 developers from over 50 countries, the company says. He is expected to touch on many of the company’s key drivers, including automotive, data centres, and gaming. Gaming has recently come into the spotlight for Nvidia, as its chips were being gobbled up like crazy at the height of the crypto craze during the end of 2017 and early 2018. Cryptocurrency miners made it nearly impossible for people to find the crucial components for PC gaming. “We expect a very upbeat tone from the company, particularly in light of the truly solid string of results the company has continued to deliver,” BMO Capital Markets analyst Ambush Srivastava said in a note to clients on Monday ahead of the conference. BMO has a target price of $US225 for shares of Nvidia – roughly 9% below the stock’s opening price of $US247 Tuesday, and well below Wall Street’s average target of $US250. The conference is also a chance for over 20 startups to show off their products to potential investors, including Nvidia itself. MIT estimated last year that Nvidia has spent around $US3 billion of its own money on research and development, but it’s also investing in smaller companies and startups working on AI applications. In an interview with Markets Insider last year, Jeff Herbst, Vice President of Business Development for Nvidia, explained that the company’s portfolio was in “early innings,” but has invested in more than 20 companies focused on everything from self-driving cars, to GPU-powered deep learning and more. Nvidia was one of the Nasdaq’s top-performing stocks of 2017, and is up 21.9% since the beginning of 2018.